Although setting up VoIP service for your home is relatively straightforward, there are some users that end up needing some level of support for a variety of reasons. Most providers offer comprehensive support information on their websites. If further assistance is needed, a providers support personnel can be contacted via phone or live chat and they will help get your service up and running quickly, with the correct VoIP setup. In most cases though, setting and installing VoIP is quick and easy. VoIP setup and integration with existing home network: There are a lot of different modems and routers that can potentially already exist in a home network. These devices can create issues with the voice calls depending on where the new adapter is connected in the setup. New and BYOD VoIP adapters: BYOD stands for Bring Your Own Device and is a popular option for new VoIP users that already own an Analog Telephony adapter (ATA). Most residential service providers do however offer an adapter for free, although there is often a shipping and handling charge to get it to you. Be aware that this is a free LEASE and you are responsible for returning the device and paying for a replacement if it breaks. Going with the free lease option should ensure that you are using the providers most tested and recommended devices, and should theoretically reduce or eliminate setup issues. If you prefer purchasing your own device, then checkout our detailed comparison of ATA's. Bandwidth issues: High speed internet access is a pre-requisite for VoIP. Unless you are running a dial-up modem or eating away at bandwidth through heavy data streaming activities, most high speed services should be more than adequate. However, it is always worth checking and you can use our speed test to ensure this will not be an issue. Configuration issues: There may be some minimal configuration required on one or more of your network devices. If you are using your own BYOD adapter, you will need to configure (sync) it to the providers network. This is typically easy and is done by resetting your device to factory defaults and then entering a customized url that will program your adapter. There can also be issues with quality of service and firewalls. Please visit our troubleshooting section for more information. We are going to focus on different VoIP setup options in this article. Does your ATA have one or two Ethernet ports? Do you have a stand-alone modem or an integrated modem and router (with wireless capability)? How many Ethernet ports do you currently have available? Internet - The picture of the cloud is associated with the entire Internet. From a home network perspective, the Internet begins at the cable or phone connector in the wall. Co-Axial or RJ-11 cable - The cable that connects from modem to the wall jack is either going to be a Co-Axial cable for cable internet service or an RJ-11 cable for a DSL type service. An RJ-11 cable is also more commonly referred to as a phone cable. Ethernet - these are simply the Cat5 cables that connect network devices together. 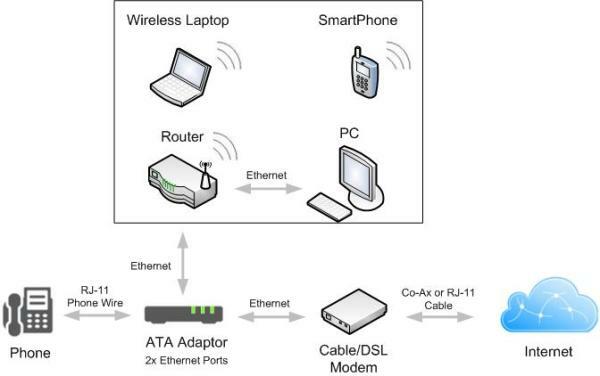 Router - in our diagrams, this device is assumed to include wireless capability or it is assumed that a wireless router is connected to it to provide wireless capability. Bottom line is that it signifies router and wireless capabilities. Routers also include firewall functionality that helps with network security and QoS capability. Router/Modem - This device has integrated modem and router capability and the diagrams also assume that wireless functionality is also included as this is becoming more common. Most of these devices also include 4 Ethernet ports. PC - the PC in the diagrams is shown as being connected via Ethernet cable but it can of course be connected on the wireless network. Laptop & Smartphone - these are included for illustration purposes as most home networks now have multiple devices connecting over the wireless network. ATA adapter - this is the device that is provided by the VoIP provider (or you if you already have one or decide to purchase at a store). It's job is to convert analog signals to digital signals that can then be encapsulated in IP packets. Phone - this can be your most basic old phone that you have used for years or a more modern DECT type phone. If you have a DECT type phone with multiple cordless phones, you need to make sure the base station device can be directly connected to the ATA adapter. Upstream - If a device is referred to as being upstream of another device, it means that it is located closer to the Internet. Downstream - If a device is referred to as being downstream of another device, it means that it is located further from the Internet. LAN - This is an acronym for Local Area Network. The LAN refers to the "local" side of the network and includes your home equipment such as PC's, Laptop's and Phones. WAN - This is an acronym for Wide Area Network. The WAN refers to the "remote" side of the network which is effectively the Internet. If a device has a WAN port then it simply means that the port should be connected to a device that is a gateway to the Internet. 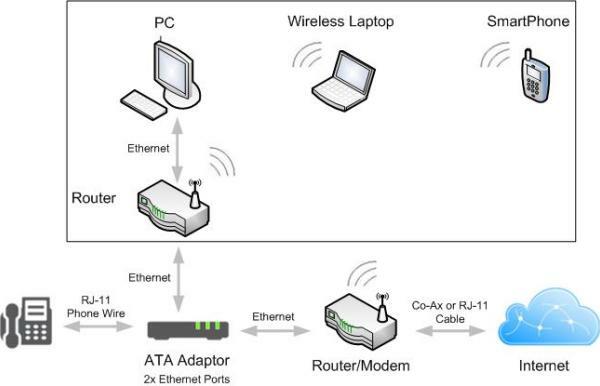 An example of this is a dual port ATA where the WAN port should be directly connected to the modem Ethernet port. Using a single port (Ethernet) ATA is not ideal as the ATA needs to hang off a shared Ethernet line that creates competition for bandwidth between the voice and data traffic. Single line ATA's are extremely common though and good service can be achieved with the correct setup and proper configuration that prioritizes the voice traffic, through use of correct Quality of Service (QoS) settings. QoS is industry terminology that is used to describe ways in which to prioritize one type of traffic over another. In this case, different types of traffic would typically be data, voice or video and you want to ensure that you voice calls get the highest prioritization. For example you do not want to experience a choppy phone conversation or get cut off during a phone call due to someone on your home network watches YouTube videos. This is a very common setup for VoIP as the ATA is simply connected to an existing Ethernet port on the router. 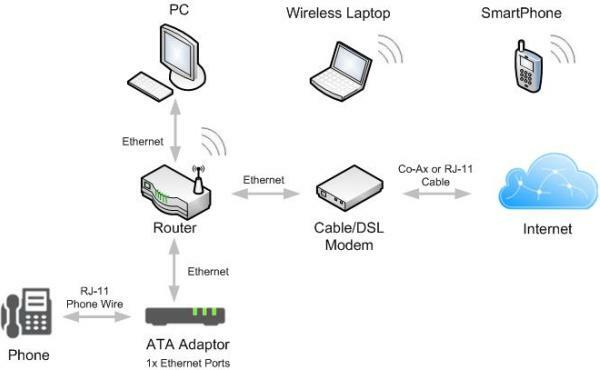 The router in this diagram is not supplied by the VoIP provider or the Internet service provider, and has likely been purchased at some point by the home owner to expand the home network. In this scenario, good voice quality can be accomplished through proper QoS configuration on the router. This simply tells the router to prioritize the voice traffic over the data traffic. Using a router is a better solution than using a basic switch as home network routers often include firewall, QoS and wireless functionality, in addition to switching. This scenario is becoming more common as many people are now getting both TV and Internet from the same company. One example of this is AT&T as they will provide an integrated router/modem controller that provides wired/wireless Internet and TV service in the home. This is the same setup as scenario 1 but with one less device. Again the key to good voice calling is QoS on the router/modem. Remember that you don't actually need a PC, laptop or Smartphone to use VoIP as all you really need is a high speed Internet and the VoIP provider will take care of everything else. In question 3 above we asked you to check how many Ethernet ports you currently have available. If you currently have a basic modem with only one Ethernet port that is currently connected to your computer, you will need to consider some form of network expansion. Hopefully this scenario does not happen very often or at all. It is worth checking though as if you have this limitation, you will need an extra Ethernet port for your new phone service. The solution to this is to purchase a cheap router (recommended) or switch to expand your network and add Ethernet ports. Be sure to do this before your VoIP service activation date. If your ATA has two Ethernet ports it opens up some new ways in which you can connect your network. The primary requirement for high quality voice calls with VoIP is to ensure that your voice traffic is prioritized over all data traffic. As previously mentioned, this is accomplished through QoS configuration which basically tells a gateway device on your internal network to allocate some bandwidth for voice traffic, regardless of how much data is being sent or received. With that being said, it is critical that QoS is in fact running on a device (ATA, router, etc) that is upstream of all devices that originate any type of traffic. In this scenario, the ATA must perform QoS. If QoS is only performed on the router it will have no affect on whether or not to prioritize voice traffic. The ports on a dual port ATA are often called the LAN port and the WAN port. The LAN port is the Local Area Network port and is the port that is connected to home network. The WAN port is the Wide Area Network and is the port that is connected to your modem device. The router/modem in this setup will likely include 2 to 4 Ethernet ports. This makes it very tempting to plug your PC into one of these ports. If the ATA is performing the QoS and the router/modem is NOT, heavy data downloads/uploads from your PC could impact your voice quality. Because this scenario also shows devices connecting to the Internet via a wireless connection, it is important that the QoS is performed on the router/modem. Router/modem and ATA do not support QoS. In this case a second router is required and should be connected between the router/modem and the ATA. The purpose of adding this router is to ensure that QoS is performed on the traffic prior to it being routed to the Internet. This should be an unlikely scenario as most routers and ATA's should support some form of QoS. With so many different devices available from multiple manufacturers, it is important to confirm QoS support. Network expansion. If you need more wired Ethernet ports in your home network, adding another router (or switch) is likely the best option. Upgrading to faster wireless network. If the existing router/modem in your home network only supports wireless 802.11 b/g protocol, you may want to create a new wireless network that is faster and supports 802.11 b/g/n. Setting up VoIP should be quick and easy in most cases, but it is possible to run into some issues that are caused by the actual way in which the network is connected. The above diagrams should aid in ensuring that you have the proper VoIP setup and that the right devices are configured with QoS. Don't get put off by the thought of having to configure anything as the provider's support staff should be able to quickly help you if needed. Please let us know if you have any comments on this topic and if you would like to see additional scenario's covered. If you have a VoIP setup that works well and is not included in the above scenarios, please let us know and we will consider adding it to this page. If your setup is listed above, please also post a comment and let others know how well it works. 1. Do I need an ATA adaptor in order to connect a VOIP phone to the NETGEAR Nighthawk router? 2. Is there any VOIP phone available in the market that I can purchase and connect it direct to the NETGEAR router for it to work? -> Response: If you need to use an analog phone then you always need an ATA to essentially turn it into an IP phone. To connect a phone directly to the router you need an IP phone. Nearly any IP phone will work as long as your router passes SIP traffic which I'm sure it will. Here is a list of IP phones. My VOIP sound quality is great unless someone in our house is using a wired or wireless computer to access the Internet - then the sound cuts in and out. My dual-port ATA is attached downstream from our integrated modem/router, because that is where the modem is. Would it help to go with Scenario 6, i.e. adding another router, just to get the computers downstream from the ATA? -> Response: Albert, it does sound like you have a QoS problem. You could even try scenario 4 if your ATA supports QoS. I am guessing you mention scenario 6 because you have a modem that has a router built in, in which case scenario 6 does make sense and just disable wireless on the modem/router. It does mean all traffic passes through the ATA but unlikely to be an issue as the bottleneck these days tend to be the Internet speed rather than anything on your home network (i.e. ATA often maxes out at 100Mb/s). I'm currently hooked as in scenario #1, however, my modem and router both have usb ports, currently not used. Can I switch my ATA to the ethernet port on the modem and then connect my modem via usb to router usb? I am using satellite Internet by the way. -> Response: Unfortunately that will not work Bruce as USB cannot be used for the real-time data transfers between these devices. As a test can you just connect the modem to the VoIP ATA using Ethernet (ignore rest of network right now), connect the phone and try making calls - is it better call quality? Just trying to see if it is QoS issues but I'm pretty sure the issue is your Satellite Internet rather than your network. Thanks for providing these diagrams as they have been helpful to me. I have experienced intermittent issues with my home VoIP and just assumed it was typical of the service. My setup was similar to scenario1 except that my ATA does have dual ports. I did a quick change and connected it the way you have it in scenario4 and have not had any issues since. I always thought there was only only way to connect this all up but now that I think about it there are quite a few different ways that need to be considered.